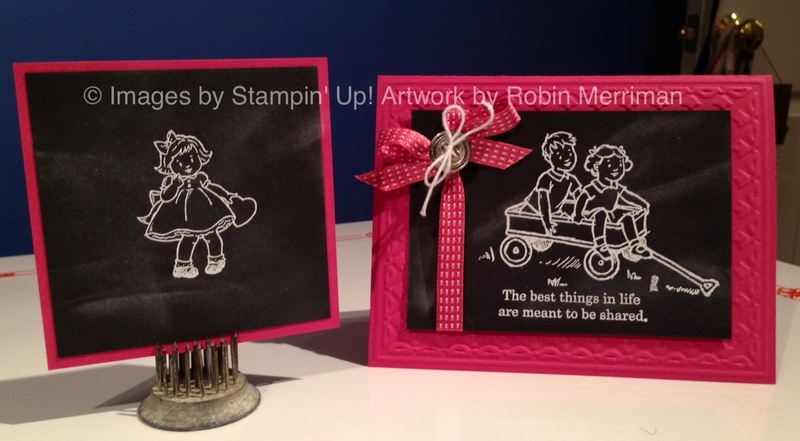 Just a quick post for you today as I head out to take Emma to school - then it's back to the studio to do all the prep work for Stampin' Fun at the Firehouse tonight! We start at 7pm - so if you want to come join us, c'mon! All the details and address are on my Monthly Class Schedule page over there in the right sidebar. This little cutie was from my Technique Geeks class last month - I featured the chalkboard technique for the first time and the gals loved it! This one is SO easy to do! The little square is the technique piece that my Geeks place in their reference book, just so they always have a sample of what the finished technique looks like. I love this finished card - that sweet image would be perfect for a valentine, don't you think? This technique is easy - the way we did it, we stamped the image with Versamark on Basic Black cardstock, heat embossed with White Embossing Powder then rubbed over top of it a bit with the Embossing Buddy. 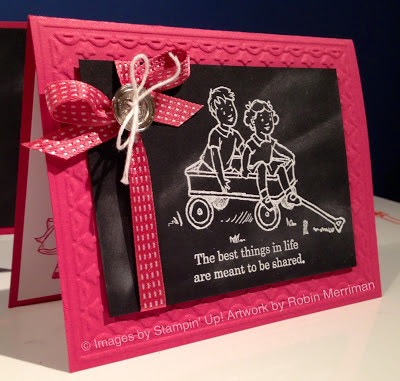 I hope you all have a wonderful day today and that you get to stamp something fun! This is a great technique. I need to try it asap! You give me your permission to publish your 1 picture to illustrate my article? Of course, your blog address will appear. I hope to hear from you very quickly.